She wouldn't let go of the tattered, dirty cloth she was hugging — which she'd used to replace her mom. 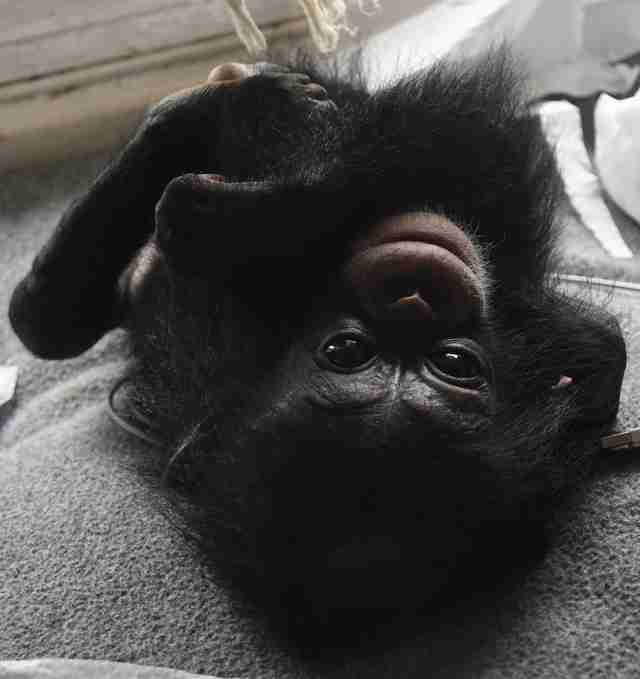 When rescuers found the baby chimp, she was sitting inside an old cardboard box, clinging to the only piece of comfort she had — a piece of tattered clothing. 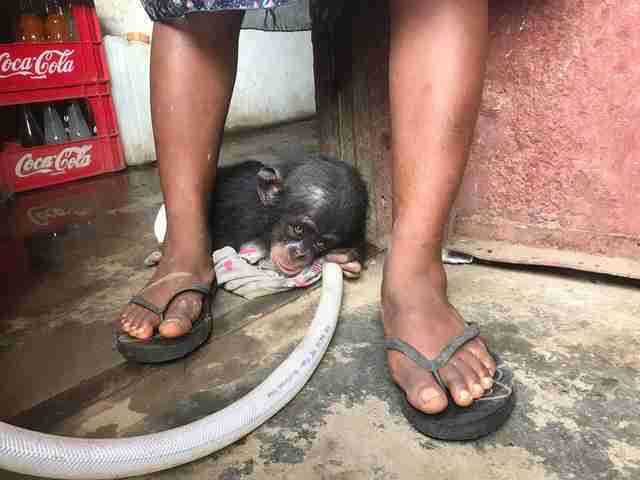 Last week, a rescue team from Liberia Chimpanzee Rescue and Protection (LCRP), along with local police and authorities from the Forestry Development Authority (FDA), found the baby chimp in a supply shop in Kakata, Liberia, after getting an anonymous tip. 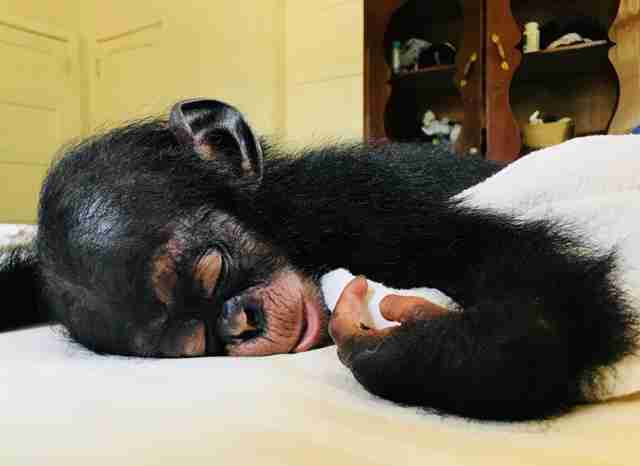 The chimp, named Chance, looked to be about a year old, and her “owners” had been keeping her as a pet for the past few months. While it’s not entirely clear how they got Chance in the first place, it was easy for the rescue team to fill in the gaps. After losing her mom in a traumatic way, Chance would have needed a lot of nurturing care — but instead, her new owners left her inside a cardboard box in the corner of their shop. Living in captivity had taken a heavy emotional toll on Chance by the time she was saved — her eyes appeared vacant, and she exhibited stereotypic behavior like rocking back and forth, according to Desmond. She also clung to her piece of tattered clothing, which seemed to be her sole source of comfort. The rescue team was concerned about Chance’s physical condition as well. Her owners had only been feeding her rice and cornmeal, and she was very skinny, malnourished and underdeveloped for her age. She also appeared to have a buildup of fluid in her head, which was probably the result of some kind of trauma. The team had to get Chance out of the shop as quickly as they could, and unfortunately, Chance’s piece of tattered clothing got left behind. 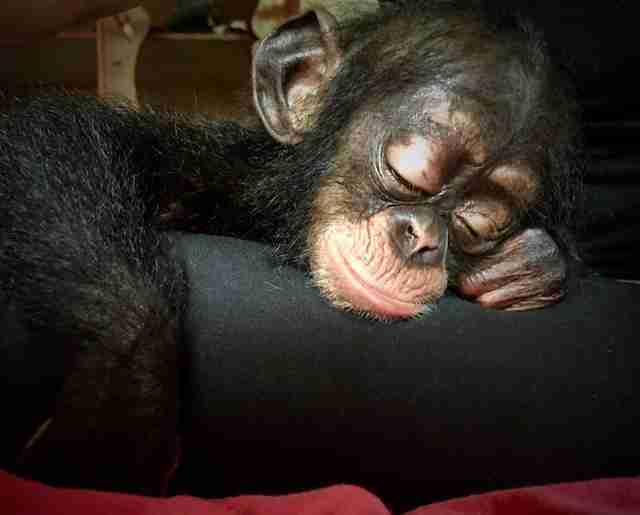 To help Chance cope, Desmond immediately gave the baby chimp another warm blanket to hold onto. But once Chance got to the rehabilitation center at LCRP, something amazing happened — Chance started becoming less dependent on the blanket. Chance has stopped rocking back and forth, and she’s starting to stand up and hold up her arms to be picked up, which Desmond said is a great sign. She’s also not clasping her feet when being carried, but wrapping her legs around Desmond’s waist, which is normal clinging behavior. Chance has even started to laugh and smile, which has filled her caretakers with joy. “It’s been very uplifting seeing this beautiful little girl blossom before our eyes,” Desmond said. Over the next several years, the caretakers at LCRP will give Chance around-the-clock care, and help her grow healthy and strong with nutritious food and lots of love. 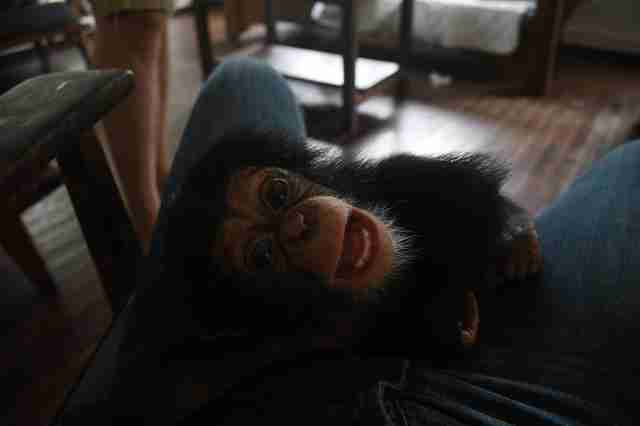 And once she’s feeling better, she’ll meet the other young chimp orphans at LCRP. 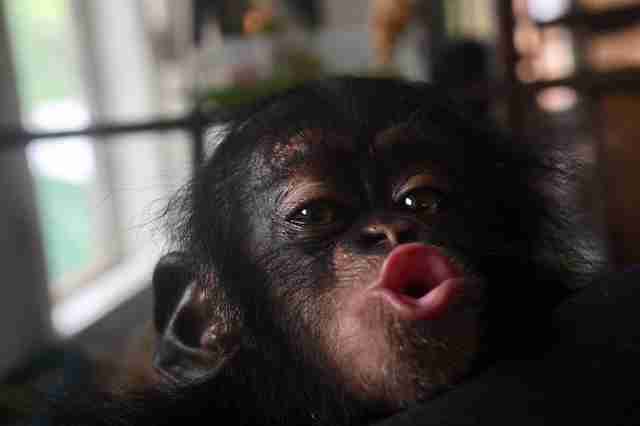 At this point, no one knows if Chance will be able to be released back into the wild, although that would be the ideal outcome, Desmond explained. If reintroduction is not possible, LCRP will make sure that Chance has the most fulfilling life she could possibly have. 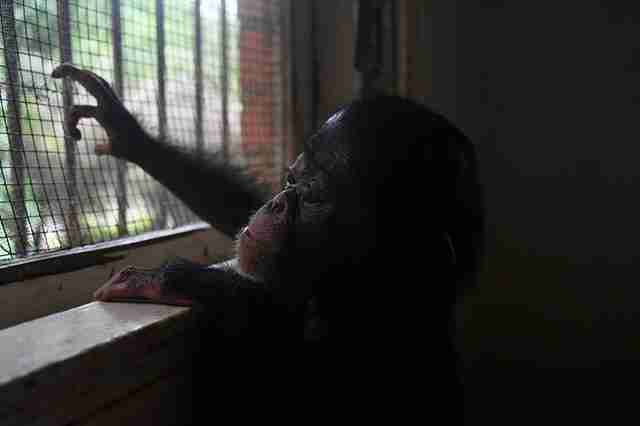 “I expect full rehabilitation and she will live in a seminatural spacious forest environment with other chimpanzees for her lifetime,” Desmond said. To help Chance grow big and strong, you can make a donation to LCRP.